Gravel Adventure bikes have been a relatively recent development in the bike market. They represent the fusion of modern lightweight cyclocross and cross-country MTB design with the old school versatility of classic touring bikes. This marriage of hi-tech design has resulted in a singularly capable breed of bikes; light enough to ride every day, versatile enough to ride almost anywhere and capable of carrying all the kit you'd need any bike adventure, on or off-road. Call them whatever you like Gravel Adventure, 50/50 Bikes, Monster Gravel or any other name that suits they all follow the same basic formula, and it's this winning blend of features and performance that has made them the fastest growing and most popular bike segment in the past few years- and this popularity continues to grow apace. If you're not a competitive racer a Gravel Adventure bike could be the perfect one bike solution for all your recreational and utility cycling needs. What is the special sauce that defines a Gravel Adventure bike? Let us explain the ingredients. A Gravel Adventure bike can be made from any material, at the entry level Aluminium is a popular choice, our own Full Monty features a 6061-T6 heat treated, double butted alloy frame and a lightweight carbon fibre bladed fork. Move up the price ladder and you'll meet lighter, stronger bikes built around complete carbon fibre framesets, such as our On-One Bish Bash Bosh, Viner's Strada Bianca and the On-One Space Chicken. All of these bikes feature a full carbon fibre frameset with lightweight, hand-built carbon fibre frames that weigh little more than a carbon road bike frame, and 100% carbon fibre forks. As well as carbon fibre frames you'll also find luxury TIG-welded titanium frames such as the On-One Pickenflick; originally conceived as a Cyclocross bike the Pickenflick can lay claim to being the first serial production Gravel Adventure bike. Titanium offers the best that aerospace materials have to offer blending, low weight, high strength, great looks and a supple ride feel that no other material can match. The geometry of Gravel Adventure bikes is exactly what you might expect it to be based on who's going to ride these bikes, where they will be ridden and how. Compared to a typical road bike, if such a thing exists, they have shorter top tubes bringing the bars closer to the rider. A Gravel bike usually has a longer head tube, raising the bars up, giving a more comfortable, slightly upright riding position that offers improved visibility for the rider. Compared to Cyclocross bikes the fork rake and head tube angle is slightly slacked out, giving a less nervous feel to the handling and helping to inspire confidence on steep off-road and fast on-road descents. Seat tube angles tend to be a degree or so slacker than the more racey XC MTBs; this puts you slightly more forward over the cranks in a position where you can utilise the strength of your glutes and lower back to help turn the pedals. As with any bike, there's variation between models but the general geometry package tells the same story, comfortable for long ride and confidence inspiring on technical and fast surfaces. Owing more to their off-road cousins than to road bikes Gravel Bikes are biased towards off-road groupsets and drivetrains. Because they're going to be ridden on rough off-road tracks and possibly carrying heavy loads up long and steep inclines a broad gear spread is usual fitment. You can expect to find off-road focused 1X (One-By) drivetrains from SRAM and Shimano that use a single front chainring with a large ratio rear cassette (11-36t or 11-42t) to give the maximum gear spread. Gear ratios of close to 400% are possible with SRAM Force 1X and 1:1 gear ratio for climbing the steepest hills offers a significant improvement over double chainset configurations. 1X drivetrains also offer the benefits of simplicity and reduced weight as well as improved chain retention when riding rough ground. If you prefer a double chainset then you'll benefit from having more gears, and smaller jumps between each gear, but you'll pay the price in increased weight and greater drivetrain complexity. Both are equally good choices and we build Gravel bikes with both 1X and 2X drivetrains. For us, the choice is simple if we're mostly going to be riding off-road them 1X is the obvious choice for all the reasons that have seen it dominate the competitive XC MTB scene for the past few seasons. If you are looking for mostly road and light trail riding and hauling heavy loads then the smaller steps between gears offered by a 2X set-up can help make your burden easier to carry. The Bish Bash Bosh is designed specifically for 1X (One-By) drivetrains while the Viner Strada Bianca is more focussed around 2X set-ups, the On-One Pickenflick and Full Monty don't really mind what you prefer, they're happy with a compact 2X or any 1X set-up. For the most part Gravel Adventure bikes use the same rims as XC orientated 29er MTB's, these are typically 700c/29er designated rims with a 17-19mm internal width, lightweight, strong, quick to spin up to speed and capable of taking a huge range of tyres from 23mm road slicks up to 40mm+ off-road rubber. As well as 700c/29ers wheels and rims 650b Gravel bikes are also becoming a popular option. The On-One Space Chicken excels in this department having the versatility to accept both 29er and 650b wheelsets allowing you fit bigger and fatter tyres, up to 48mm for maximum traction and enhanced comfort. As well as options in tyre size, you have choices regarding whether you run inner tubes or a tubeless tyre set-up. Inner tubes are familiar to all cyclists, depending on whether you come from a road of off-road background you may not know much about tubeless tyres. In a nutshell, tubeless tyres are a tighter fit on the rim and are fitted in combination with an airtight rim tape to eliminate the need for an inner tube. You use them with a liquid tyre sealant that is retained in the wheel and works to seal small to moderate holes in the tyre. Tubeless tyres take a bit of setting up, but once you are used to them you might not want to go back; tubeless tyres save you the weight of an inner tube, they offer self-sealing for small tyre injuries and you can run them at much lower tyre pressures which hugely enhances off-road grip. Disc brakes also feature heavily on Gravel Bikes; in fact, you're not really a Gravel Bike if you've only got rim brakes. Off-road riding and load lugging demand high-quality brakes and there's no more effortless and powerful solution than disc brakes. If you're on a budget mechanical disc brakes can provide ample braking power, for the last word in serious braking performance and ease of use we feel that you simply can't beat a hydraulic disc brake. Hydraulics offer power and modulation that's unbeatable helping you stay in control at speed and haul on the anchors when required. Gravel Bikes fall between road bikes and MTBs in terms of finishing kit. It's usual to see them with drop bars and standard length road style stems. A slightly more padded saddle than one would expect on a lightweight road bike is a wise choice, with more bumps and buffeting from various road and tracks being a given a little bit of padding goes a long way. For pedals it's clipless all the way, commuter pedals with one SPD side and one flat pedal side are popular with riders who intend to use their Gravel Bike as a do-it-all, adventure, utility and commuter machine. If you're just thinking about riding it off-road and never expecting just to pop to the local shops or the pub then it's double sided clipless pedals all the way; road pedals don't cut it (apart from Shimano's A600 tourers ) you want MTB SPDs all the way, small, compact, lightweight, quick to shed mud and they work with all the sensible, knobbly soled cycling shoes that you might want to wear. 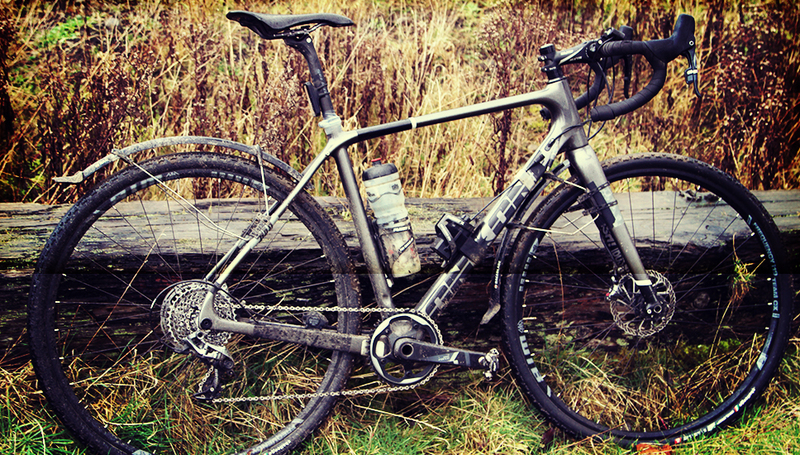 Your Gravel Bike is as versatile as you want it to be. Most of them come with mudguard and/or rack mounts. Frame bags, large handlebar bags and tubular saddlebags are the preferred choice for hauling items on a long ride. Add in a decent pair of cycling shoes, cycling shorts and a selection of baselayers and some quality technical outerwear from our 365 range and you're all set. If you're looking for the most versatile Gravel Adventure bike possible and aren't sure if you prefer the fast rolling 29er wheel or the more nimble and agile 650b wheelset then the Space Chicken is the bike for you. This |Monster Gravel will take on any trail, it's built for the long haul and it represents the cutting edge of modern Gravel Adventure Bike design. The Viner Strada Bianca offers most of the Space Chicken's versatility, it'll take tyres up to 40mm in size to provide plenty of cushion for backcountry adventuring and it's designed to take 1X and 2X drivetrains. The On-One Bish Bash Bosh is a bit more of a thoroughbred, it's a paired back Gravel bike design to take up to a 38mm tyre and it's designed exclusively for 1X drivetrains. If you're a roadie looking for off-road adventure and want a nimble bike that can handle anything, as well as the daily commute then the Bish Bash Bosh has been built for you. If you think that a titanium frame is right for you then the award winning Pickenflick is a dead cert, built with a focus on Cyclocross and adventure riding the Pickenflick is a symphony in advanced metallurgy. Last but by no means least comes the Full Monty, our alloy framed Gravel bike with a carbon bladed fork. The Full Monty is built to take mudguards and full panniers and it's the perfect load luger for cyclists on a budget. Whichever you choose you can't go wrong, each of these bikes represents excellent value for money and together they cover the full spectrum of Gravel Adventure riding. Gravel Adventure bikes are packed with versatility, with larger grippier tyres and frame fit bags attached they become an off-road mud hound, fit high volume, fast rolling touring tyres for a supremely capable workhorse or run them with slicks for some fast road riding. However and wherever you use your Gravel Adventure bike you are assured of a superbly handling, impeccably well-mannered bike that is simply a joy to ride.